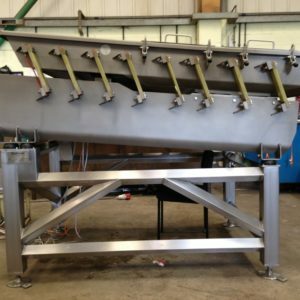 Dodman vibratory systems are renowned for reliability, easy cleaning, gentle product handling and precise control. 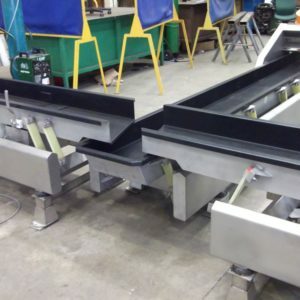 A vibratory feeder or conveyor is a device used to move product from one area of the production line to another, or from one process to the next using vibration. 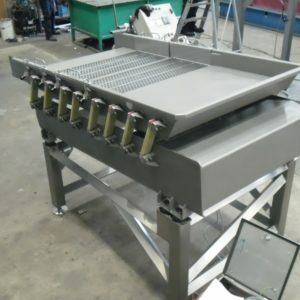 Product movement is created by cleverly orientating the drives so that the vibration causes the product to ‘hop’ along the feeder tray many times a second. 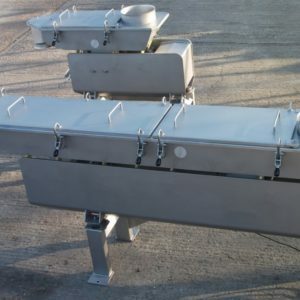 Vibrating feeders are used as they provide an even flow of product. 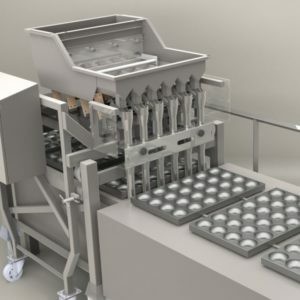 An even bed depth and flow are often required for processes such as metering and separating. The product is moved along a solid tray. 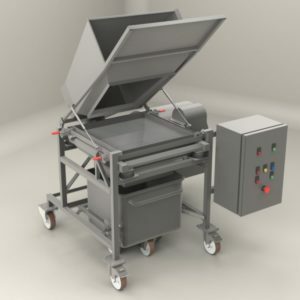 With no joins or mechanisms to trap the product, maintenance and cleaning is simplified. 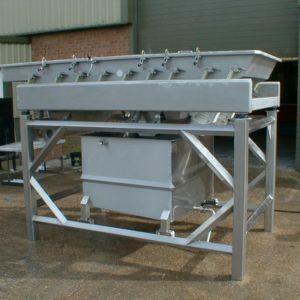 The clean design of the Dodman vibrating feeder results in less production downtime. Furthermore, the product is less likely to be damaged. 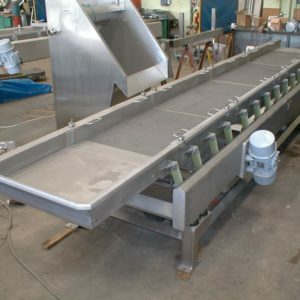 Typical vibratory feeders use an electromagnetic drive to create a high frequency, low amplitude vibration. 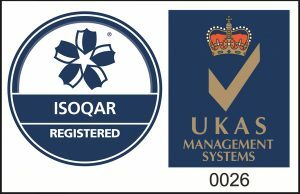 These are particularly suitable for high accuracy low throughputs. Out-of-balance motors are commonly used in more heavy-duty feeder applications, as they can apply greater forces than an electromagnetic drive. These are used for high throughputs. 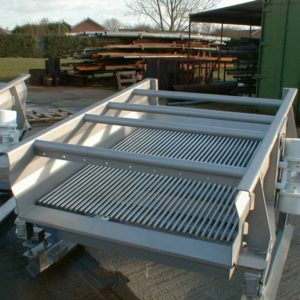 Our engineers will select the most appropriate technology to suit the needs of your systems from our extensive range of vibratory products. 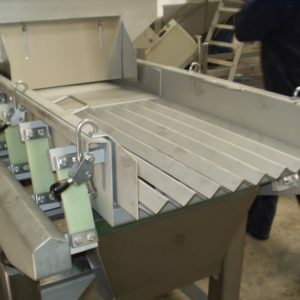 We have solutions to meet your exact requirements for the gentle handling for fragile products or high amplitude conveying for screening applications. We combine innovation and specialist knowledge to ensure that we provide the cleanest, safest, most reliable systems to deliver high accuracy, gentle product handling with flexibility and control. 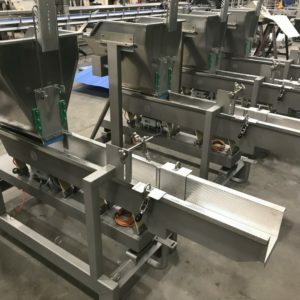 Dodman vibratory feeders provide solutions for metering, conveying, inspection, distribution, glazing, grading, laning and dewatering. 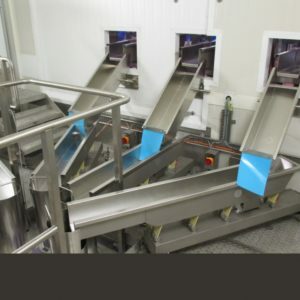 If you operate within the food production industry, we are confident that we can provide flexible, efficient and innovative solutions to meet your food processing and food manufacturing needs. We are here whenever you need us.